Check out TuanTuan's 'Til You Drop Promo! Feast your eyes (and your tummy!) to unlimited TuanTuan Signature Snow Buns, dimsum, and more, with 1 serving from our single-order selection all for only P498+! 2. Promo runs from July 2 - 31, 2018. Valid in the following branches: SM Megamall, Promenade, SM Aura, Power Plant Mall, and UP Town Center. 3. Promo is available from Monday-Saturday only. Not applicable during holidays. 4. 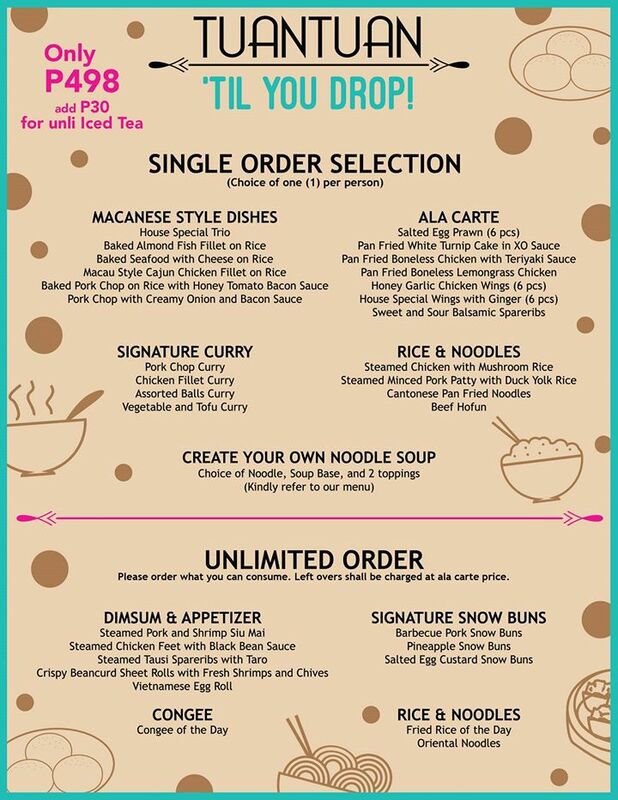 Unlimited serving from Signature Snow Buns, Dimsum & Appetizer, Congee, and Rice & Noodles. 5. A choice of ONE (1) dish from the Single Order Selection per person only. 6. Customer may add P30 for unlimited Iced Tea. 7. Strictly no take-out or left overs. Left over food will be charged based on regular ala carte menu price. 8. Unlimited items shall be available from opening until 30 minutes before closing. 9. All table members are to have unison order. 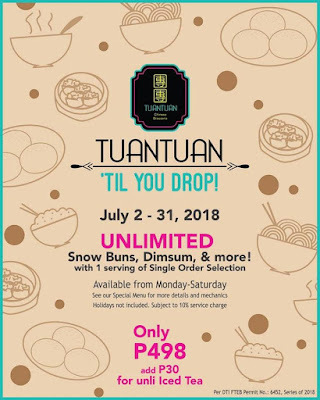 Either entire table is to order ala carte or all are to avail of TuanTuan Til You Drop. Combination order is not allowed. 10. 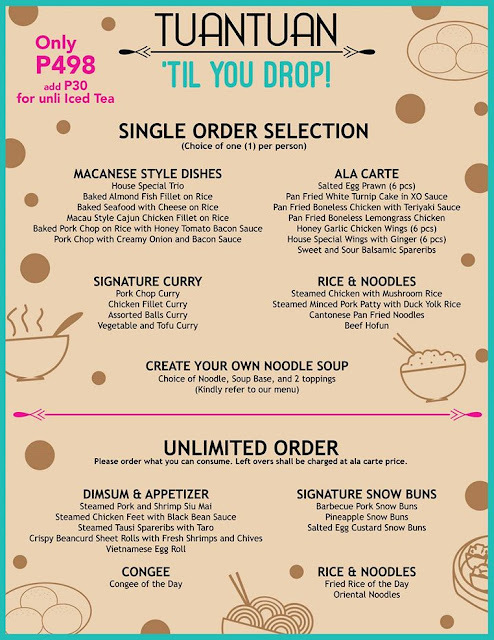 Children up to 120 cm may avail of our unlimited option (no Single Order Selection) for only P268. 11. The purchase of goods and services which are on promotion discount, the senior citizen can avail of the promotion discount or the discount provided under the expanded senior citizen act of 2010, whichever is higher. 12. Senior Citizens may only avail of the VAT exemption in the event that the discount promo offer is availed. 13. Cannot be combined with any other promo or discount. 14. Promo price is subject to 10% service charge.